One of the nice things about non-HAEDs is how quickly space on the fabric seems to get filled up. I only worked on this for 3 days, and not really so much time on those days, but am still able to mark off about 8000 stitches. I had a most horrible time piecing this together from the scans. I can't find a way to alter the way Photostitch automatically put the images together and ended up having to scan the middle and end section twice because it was matching up stuff wrong. I gave PhotoImpact a try before scanning again, but I ended up not wanting to take the time to figure it out. One more thing on the list of stuff I'd like to play with, but never make the time for! I'm going to start working on Song of the Dead tonight. I have it started on 28 count greyish blue Jobelan, but have since learned that I really don't like working with Jobelan. And I particularly don't like the 28 count. I was going to restart it on the 20 count pewter Lugana I got, but after trying Motherhood on it and hating it, I decided that's not a such good idea. I'm thinking about restarting on 25 count antique white Lugana. After much experimentation, I've decided that is my favorite fabric. But since the design has a lot of black, I'm concerned about coverage. But wait, I recall somewhat liking the 28 count Monaco I'm doing Broken Angel on. I know I have some, but I wonder if it's wide enough? Hmmmm... Off to rummage through my stash. Check this space in about four days if you're interested in the outcome. I'm very annoyed with Blogrolling not updating. It makes it so much easier to click on the blogs marked new! I checked on the Blogrolling site to see what was going on and discovered that you can use this form to manually send a notification to BlogRolling that your site has been updated. A pain, but at least it's a way to let others know that you've updated. I love working on this one. The blues are so pretty and it is stitching up pretty quickly. Stitched on 25 count antique white Lugana, 1 x 1. My, my we had quite a Christmas! Saturday Randi couldn't sleep because her ear hurt. She also had a fever -- I don't know how high since she's a bit obsessed about taking her temperature and had broken the thermometer. I finally convinced her to take some tylenol and she slept for a bit after that. So I looked up some home remedies and set off Sunday to get stuff for her ear and more pain killer. Oh, and a new thermometer (I learned my lesson and got a cheap one this time). It took a couple of tries and much adamant protest from her, but I think her ear is going to be okay. We got the tree out of the shed, only to discover that the top portion had broken off. Kelsey tried to blame it on Drew (who has a tendency to just throw things in the shed and this would not be the first time something got broke). But I'm thinking the real culprit is the fiber optic angel topper I bought last year. She was quite heavy and by the time I took the tree down, she was pretty much upside down. The older two didn't even want to put the tree up at all, but I figured we could just go with a 3/4 tree this year. And it kind of turns out to be a good thing, since the angel sits quite securely on what remains. Randi's ear would start bothering her when she stood, so I ended up decorating the tree all by myself. I really need to get some new ornaments! The older kids also told me I was trashy since I only put the lights on the front part of the tree. Oh, well. Seeing how they refused to help decorate I figured I could be as trashy as I wanted. Kelsey cooked dinner and Randi flat out refused to eat. Drew wasn't too impressed, but he ate it. And Kelsey was mad because she wanted ham and so wouldn't eat the chicken. She did eat all the brussel sprouts, though, so she certainly made up for it! I thought the food was delightful and while, I'm sorry to say, the company left a little to be desired, I just keep telling myself they're teenagers. And Randi was sick. I at least had a most lovely dinner. Randi was feeling better, but since she had slept most of the day, she was unable to sleep when she was supposed to. And her stomach was hurting because she wouldn't eat. She spent much of the night whining because she didn't want anything I suggested that might help her. What she wanted was for me to go to bed, which I couldn't do because I had to play Santa and was waiting for her to fall asleep! So after waiting over an hour for her to dose off, I just hoped she'd stay in the room and got everything under the tree. Thank goodness I had all the gifts wrapped! Normally I do most of it on Christmas Eve, which would have been impossible this year. Once again, my guardian angel is looking out for me! She did catch me filling up the stockings, or rather the gift bags we were using for stockings since I have no idea where the ones I bought last year are. But I don't think she saw anything. She will be 9 soon and a friend has told her there is no Santa. She still wants to believe, though, but I think that next year she will be unable to hold onto that fantasy any longer. The girls kindly let me sleep until 8 this morning. And then Randi made me a cup of coffee (I love my Tassimo!) to bribe me out of bed. We opened our gifts and I was pleasantly surprised that the girls had picked something out for me when they went shopping with my mother when we were visiting over Thanksgiving. I can't believe they managed to keep it from me all this time! Randi is generally not so good at keeping secrets. They got me a most wonderful pink nightshirt covered in hearts and it's the right size! And seriously, that was all I needed to make my Christmas perfect. Randi was feeling much better, and played with her new toys all day. Kelsey was grateful and pleased with everything she received and made a special effort to be the perfect daughter and sister today. But, of course, in my dysfunctional family nothing can be perfectly perfect and Drew was nasty and rude from the moment he yelled at us when we woke him until he disappeared into his room later in the day. Again, I tell myself he's a teenager. And I ignored him the best I could. And regardless of the half-assed way I do things and the trouble I have with the kids, I wouldn't trade my Christmas for anything. Stitched on 25 count spun silver Jobelan. I had hoped to get more than this done, since I'm on vacation and kids last day wasn't until yesterday. But I've spent too much time obsessing over other things! Plus the little one hasn't been feeling herself and stayed home a couple of days this week. I have managed to get my Christmas shopping completely done and have everything wrapped and ready to go under the tree Sunday night. Now if only I could muster up the where-with-all to go digging around in the shed for the tree itself and get that put up, I'd be 100% ready! I was very disappointed with this book. I'd heard great things about it way back when I used to frequent rec.arts.sf.written, particularly in comparison to some of my most favorite authors/books. I hadn't had a really good read in awhile and so I picked this out from my too read pile thinking about all those glowing reviews and how hard it was to come by at a reasonable price. It started out quite nicely with delightfully quirky characters. And then went... nowhere. I kept waiting for the characters to find themselves in this other "world", Aegypt, but half way through it became obvious that Aegypt was really only a concept. The way the world once was, but changed to the world we live in now and no one remembers it. The main character half-way remembers it or something and decides to write a book about it. Close to a third of the book was excerpts from made up historical fiction books that happen to support the Aegypt theory. So now I'm reading A Feast for Crows, which I saved for my holiday break so I wouldn't have to lug a hard cover around with me. Other than not being able to remember some of the point of view characters, it seems to be okay so far. Hopefully it will break my run of books that don't live up to my expectations. Although, seeing how the first three books in the series were so good, I'm probably setting myself up for another disappointment. I finished up round 3 of my rotation with Babysitting rather than Motherhood (as indicated in a previous entry). 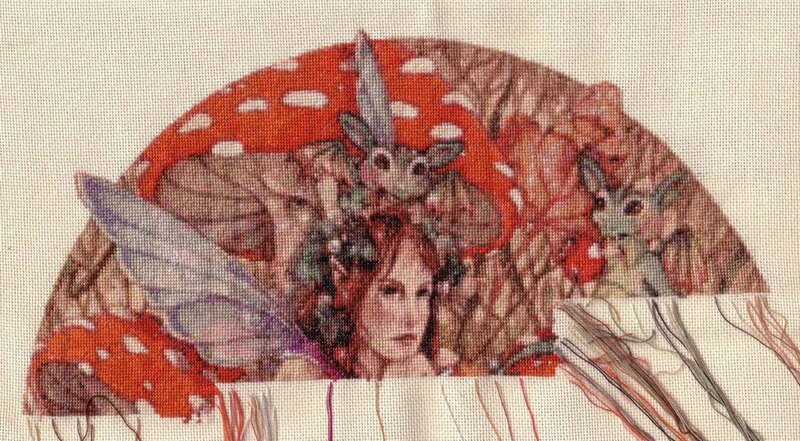 I worked on her for four days and got in 3,000 stitches. At that rate it'll take about 18 months to finish! Provided I'm able to stick with the 4 days, that is. And the rotation itself, for that matter, although so far it seems to be working fairly well. 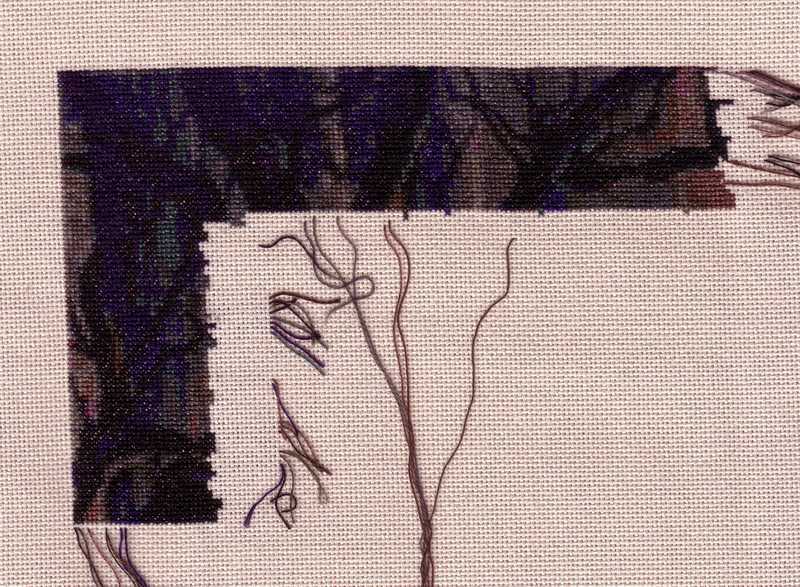 But really, since I'm not stitching the background she won't take quite that long to finish. Isn't she marvelous? I just love those little dragon babies! Here's the link to her page. I haven't decided on the pieces for the next round yet. All I know is I'll be starting Beauty and the Beast (the one by Yvonne Gilbert) in the "anything goes" slot. How many teenagers does it take to change a car light bulb? The front driver side turn signal on my car stopped working. So I got a bulb and told my son to replace it. He's driving now so he might as well learn how to do this. But he couldn't do it. I learned how to do all this stuff myself by reading the manual, directions, and/or looking up info on the net. I mean it's not rocket science and this is a smart boy. First he can't find the manual. It's not in the glovebox where it should be and he was the last one to use it! I tell him it must be somewhere in the car and what did he do with it when he was done looking at it. After much arguing, he looks for it. It turns up in his room (minus the nice leather cover). No info in there (other than take it to a dealer, yeah right). So I did a web search and couldn't find anything, finally I looked under Ford Tempo and found some directions there, printed them up and gave them to him. He comes back and tells me he can't do it because the salt air has corroded the screws. I get annoyed. He tells me I have no reason to be annoyed since it's now impossible to fix. Okay, how much do you want to bet when I go out there tomorrow it gets fixed. Regardless of having directions for the wrong car and corroded screws? Because I use the brain that God gave me to figure out a solution. This is a thing that drives me nuts about my two teenagers, they need minute step-by-step directions to do anything. They don't ever figure out anything for themselves. My daughter is failing science and says it's the teacher's fault because the teacher won't show her how to do the assignments. She doesn't even bother to read the instructions because that would take too long. So she just doesn't bother doing it. And this is the teacher's fault? How are these children supposed to function as adults? Lovely, isn't it? I really like how the silhouttes of the trees are turning out. Michelle is quite a genius when it comes to charting -- it would have been so easy for the bunches of pine needles to look like blobs. I spent a lot of time gaping in wonder at the detail on this. I put in some stitches on Motherhood earlier and have decided to trash it. 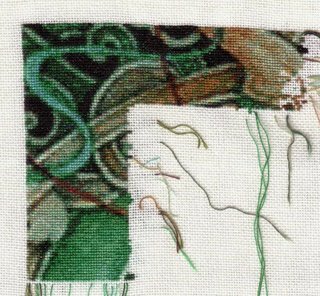 I really dislike stitching with two threads! I also was not enjoying the lavendar fabric which is so close to many of the thread colors. 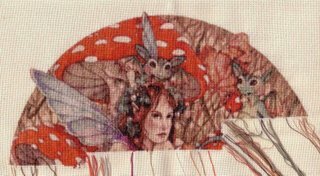 I had about 4,000 stitches done on this previously, but decided to restart because I had used a full cross of the Kreinik braid and it bunched up and made the poor woman look like she had shiny scars on her body. I also wanted to try the 20 count fabric on something small. Anyway, I may go back to my first attempt -- once it's framed the ridges of Kreinik may not be so noticable. I was going to pick up the first Motherhood WIP and work on that in the finishing slot, but had a brainstorm when reading the HAED message board. I've got quite a bit of work done on Babysitting and would really like to see it finished. But at the rate I'm going (and trying to fit everything in) that would be years. So I've decided to change the rules for the finishing slot and instead of working on the piece with the fewest number of stitches to go I'm going to work on a piece I'd like to get finished sooner rather than later. Which for now will be Babysitting. It feels good to be sticking to the four day rule. Even though I'm not getting a lot done on each project, I'm making some progress and part of the point is to get a chance to work on everything within a reasonable period. I'd like to be able to work on everything at least once a year, but if I keep stacking the rotation with HAEDs, it will take closer to three to get through all my other WIPs. Which sounds soooooo pathetic, but it's a hobby right? Of course the reason I'm whipping through my rotation is that I want to start Yvonne Gilbert's Beauty and the Beast, which I plan to put in the "anything goes" slot of the next round. Which, if I keep to the four day thing, I'll be able to do the second day of my holiday break so I'll also be able to dedicate some time to it. I probably won't be able to finish Motherhood in four days, since I only managed to get 900 stitches done when I restarted it. You wouldn't think that a monochromatic design would be so difficult to stitch! Oh, well, I'll just pick it back up to finish at the end of the next round. It doesn't look like much, but I managed to get over 3000 stitches done in those four days. I did work on Desiderata, but only for two days. I'm getting very close to the end on this one, the acorn band is next. Sorry, no pic since I was in a horrible mood that day and didn't feel like scanning the thing. It's so long! And the camera batteries are dead (I had to use them in the electric screw driver to fix my bedroom door that my daughter's friend had ripped off the hinges). I keep forgetting to charge them up, and I keep kicking myself. If I had charged batteries in my camera, you might be seeing a pic of Desiderata, but you'd certainly be seeing a pic of my youngest with a blanket wrapped around her head like a burnoose while she was sleeping. She was looking pretty cute. So I've gotten all the "must have" gifts. I still have some things on my list that I'd like to get, but they will have to wait until (and if) I get child support. I am finding it very difficult to motivate myself today. I need to get up, get dressed and get down to the store. I need to pick up the house. I really need to do some laundry. As it is nothing will be dry by tomorrow. Those were my plans for the day. And here it is almost 8:00 pm and all I've managed to do is get up. Which I didn't do until close to 3:00. I'm not quite sure what has happened to the last 5 hours. Blah. I really hate feeling like this, and I know I should just get off my behind and just DO IT, but I just can't seem to move. I'm so stuck, I haven't even gotten up to get anything to eat. That, however, is probably a benefit.